I was referred to Ian McDermott after my fourth arthroscopy on my right knee, all of which had provided temporary relief at best and, at worst, been a waste of time. I was fully expecting him to advise that I would have two choices; A) a full knee replacement, or B) wait until your knee is bad enough for a full knee replacement! I was delighted though, to find that there were a range of options open to me, none of which involved total knee replacement. Some of these options were not going to be viable due to age or the specific issues that existed with my knee, but the final option which I decided was best suited to me was Patellofemoral Arthroplasty or, partial knee replacement. The operation took place in March and was a complete success, and I was up and about walking within 48 hours, followed by intensive physiotherapy. I was walking over a mile or more with little or no discomfort within two weeks. 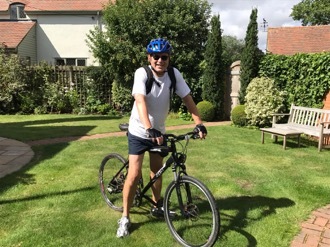 I am now three months post operation and am walking normally, cycling over 15 miles with very little effect from my knee, other than my quads protesting at the effort they are having to make once again! Without doubt, this type of surgery has been an absolute boon for me and I am no pain free in that knee for the first time in over fifteen years. I cannot recommend Mr McDermott too highly and would have no hesitation in recommending his services to anyone suffering from persistent knee pain.